San Clemente is my second choice for where I'd want to end up and raise my family (right after Carlsbad and right before anywhere in North Carolina), which is a little funny considering how little time I've actually spent there. It's got the downtown, the beaches and weather, the shopping, and the general feel that I love in a town. King Henry and I took a little morning trip up to Orange County last week. 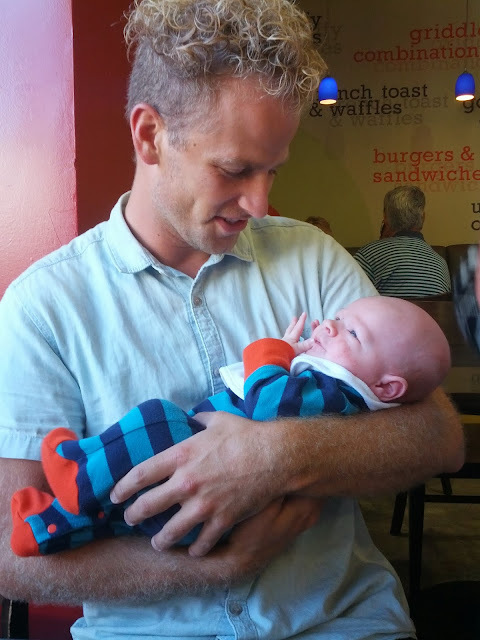 I called up Conrad's cousin's wife Elise and we decided to grab some breakfast so she and her husband Drew and baby Finn could meet Hen. We met at this little pancake house called Stacks right on Pacific Coast Highway (by the way, PCH has some of the best food, whether you're in San Diego, Orange, or Los Angeles County. Start there if you're looking). 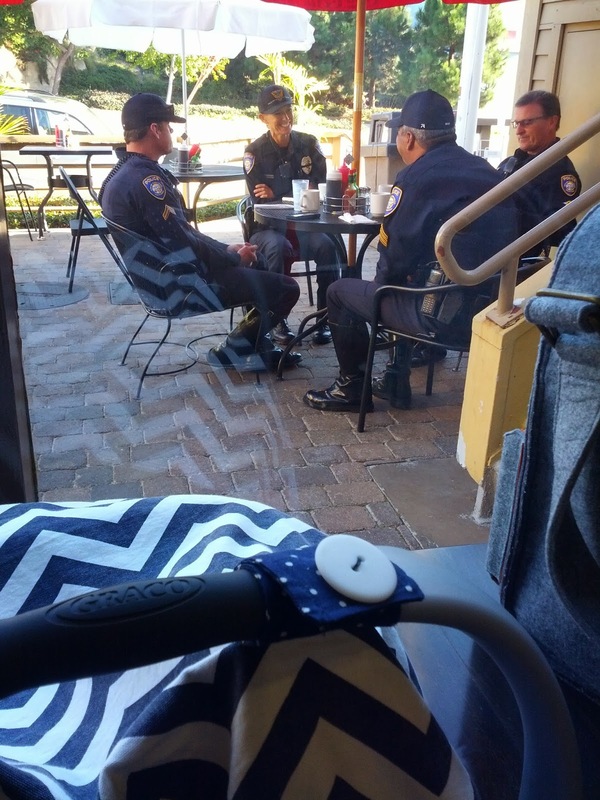 A quick aside: There were these police officers (from Carlsbad - imagine that!) who were wearing the most stylish uniforms and boots I've ever seen on officers before. I had to creep and take a picture, and karma got me back by making a glare on the window, but the picture doesn't even show the sheer chicness of the outfits (cops everywhere want me to die now, for swooning over uniforms and calling them outfits). You should have seen them standing in line. If I wasn't dying for new boots before (I was), I am now. The menu was crazy in a good way. Anything with chocolate was out, so no nutella or cookies 'n' cream on waffles or pancakes or crepes for me. The Boss says no, on account of his little organs are brand new and chocolate makes them scream. I was going back and forth between the Mac'nut Banana pancakes, the Captain Mac'nut French toast, a crepe, or an omelet of some sort. I decided to go with the Garden Stuffed Crepes since yesterday I had a headache and didn't want to overload on sugar and invite it back (though I'm not positive the headache was from sugar, hormones, or not leaving the house all day). I was so occupied with how good the crepes were that I didn't get one single picture, not even of the plate after all the food was gone. Henry slept quietly with his head all flopped over in his carseat, and then we took him out and he snuggled both Drew and Elise. He started to stir, so he stretched really hard with his lips pursed and his legs scrunched up and his arms bent back over his shoulders, and Elise told him to "stop it right now or I'm going to get pregnant tonight!" Good to know Hen is as cute to other people as he is to me. Drew kept saying "I love you Henry" and my mama heart about upped and gave out. 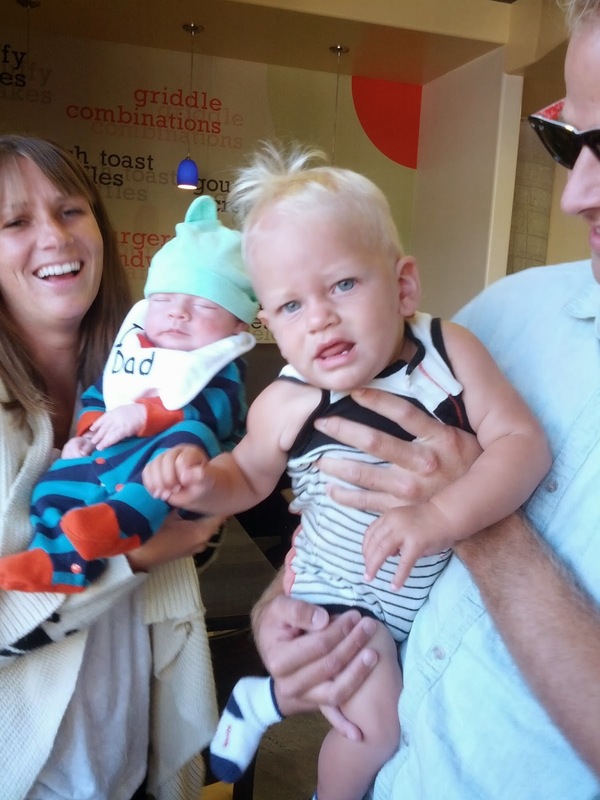 Drew was born just a couple weeks before Conrad, and Finn is nine months older than Henry. We had considered calling Hen "Huck" as a nickname before he was born, and it would have been the most outrageous duo ever - Huck and Finn. The name hasn't quite felt right yet, but maybe it will later on. ^^^Henry's face. I can't even look at it, it's so wonderful. If I wasn't four weeks postpartum, I'd be at risk for getting pregnant, too.